Our fleet consists of 29 aircraft in operation including 22 Airbus and 7 Boeing. 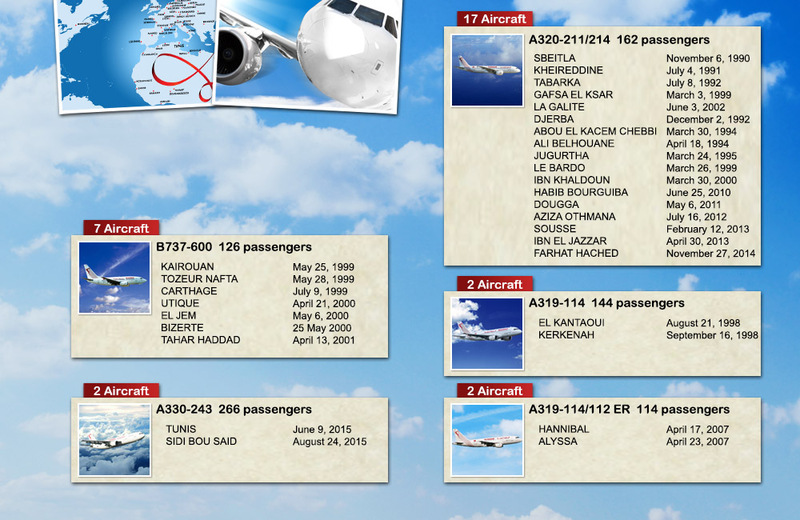 16 Airbus A320-211/214 named « Sbeitla », «Kheireddine », «Djerba», « Abou El Kacem Chebbi », « Ali Balhouane », « Jugurtha », « Gafsa El Ksar », « Le Bardo », « Ibn Khaldoun », « La Galite », «Habib Bourguiba », « Dogga », « Aziza Othmana », « Sousse », « Ibn El Jazzar » and « Farhat Hached ».The A320 can accommodate up to 162 passengers. 2 Airbus A319-114 named «El Kantaoui »and « Kerkennah », The A319 can accommodate up to 144 passengers. 2 Airbus A319-114/112 named « Hannibal » and « Alyssa ».The A319ER can accommodate up to 114 passengers. 2 Airbus A330-243 named « Tunis » and « Sidi Bou Saïd ».The A330 can accommodate up to 266 passengers. 7 Boeing B737-600 named « Kairouan », « Tozeur Nefta », « Carthage », « Utique », « El Jem », « Bizerte » and « Tahar Haddad ».The B737-600 can accommodate up to 126 passengers.